Healthcare industry has goldmines of data at their disposal. However, the healthcare companies have to comply with multiple regulations and ensure strict security while processing the data. This is why DevOps approach to infrastructure management is very beneficial for healthcare. Healthcare industry has grown and matured significantly over the decades. From shelves filled with cardboards with files it moved on to utilizing the latest IT technology available — dedicated data centers and public or private cloud infrastructure. However, despite being a noble activity, healthcare is still a business and must be profitable. Thus said, when all the healthcare market players leverage the same type of hardware, the competitive edge must be gained elsewhere. Reputable experts predict 2018 to become the year of mass adoption of DevOps approach in enterprise healthcare industry, to respond to the ever-increasing requests for data-driven, interactive and responsive care. As Dr. Werner Vogels, the Amazon CTO said during his keynote speech at AWS Summit London 2018, the Infrastructure-as-a-Service component of AWS offers has largely matured by 2009 and is being mostly fine-tuned now. The new field of competition for any industry now lies not with the infrastructure they use, it’s all about HOW EFFICIENTLY they use their cloud infrastructure. This is exactly where the DevOps approach to IT operations comes in, as it really is the prerequisite for fielding the next big thing Amazon is offering — the ML-optimized Big Data solutions. The main point of leveraging the Big Data analytics is assessing all the volume of data available. This is hard for conventional servers as they were not designed to be able to sufficiently deal with 3 V’s of Big Data: all the variety of the data types gathered, the sheer volume of the data to process and the huge velocity of the data incoming. This applies to healthcare industry specifically, as there are troves of data available to every healthcare business company, and not each of them can leverage this data to the fullest extent. The solution to this challenge lies with developing and deploying the Machine Learning (ML) models for processing the data collected. These Artificial Intelligence (AI) algorithms are able to analyze the data in order to uncover hidden patterns and turn this knowledge into actionable insights through in-depth data visualization. However, a flexible and resilient infrastructure remains the main requirement for deploying the Big Data visualization tools, which enable the 4th V of Big Data — its value, the power to make informed business decisions and gain tangible benefits. Better business agility, so the healthcare companies can address the customer requests faster and shorten the feedback implementation loops to deliver value to their customers faster. As you can see, opting for the DevOps methodology of IT infrastructure management can be the catalyst for successfully implementing Big Data methods of data analysis. The only question remains — what do the DevOps workflows mean for healthcare? 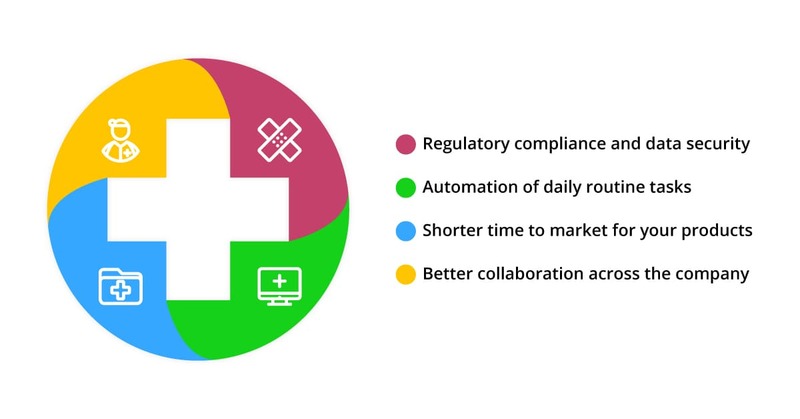 What does the DevOps approach mean for the healthcare industry? Regulatory compliance and data security. After the GDPR came into effect in May of 2018, handling the personal data of the customers became much more closely monitored and regulated. Several of the main requirements of the new regulation are as follows: limiting the levels of access to the data to the minimally required, ensuring the transparency of data handling, security of data storage and the customer’s right to demand deletion of their personal details at will, the so-called “right to be forgotten”. DevOps culture is aimed at maximum efficiency of delivering value to the customers. This means eliminating all kinds of waste, as well as ensuring optimal performance and security of operations. In terms of software delivery, automated unit tests ensure the thorough code testing to minimize the risk of code bugs and backdoor access to the apps. In terms of operations, constant monitoring of infrastructure performance allows determining the optimal ways of system functioning, removing multiple bottlenecks and potential security breaches. In terms of compliance, the regulatory requirements are easily codified and automatically applied while designing and implementing the cloud infrastructure, greatly reducing the operational overhead and simplifying the compliance checks from the authorities. Automation of daily routine tasks. There are many processes and tasks that take up much valuable time, which means the IT department cannot concentrate on improving the infrastructure in use and has to solve the repetitive tasks instead. These tasks might include configuration checks, installing the software updates, performing database backups, monitoring the workloads, following the infrastructure health checklists, etc. The key point here is that such tasks are repetitive, and they mostly do not require much skill. These operations can be automated quite easily, using some of the popular DevOps tools. Such an approach enables the CI/CD pipelines, meaning the majority of daily routine tasks are done in the background, so your IT team can allocate the resources to deliver more value to end users. Shorter time to market for your products. When the cloud infrastructure management is automated, the software delivery lifecycle becomes much more predictable and the resulting time to market for your product updates is significantly shorter. Better collaboration across the company. Once the DevOps workflows and practices are established, the collaboration between various departments of your company becomes much easier. Aside from the obvious speed-up of accomplishing various requests of other teams, your IT operations team will have a better standing in terms of management efficiency and cooperation with the Big Data analysis team. 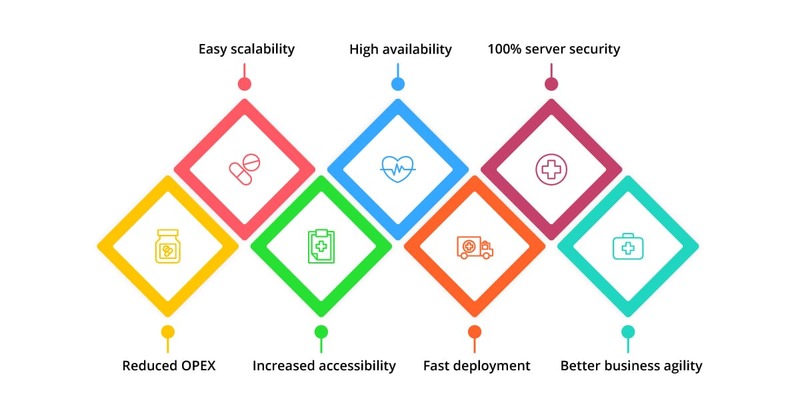 As you can see, implementing DevOps strategy of IT operations in healthcare industry provides a powerful lever for optimizing the infrastructure performance and expenses, shortening the development cycle for your apps, improving the employee collaboration and allowing to utilize the Big Data at your disposal to the fullest extent and with utmost security. 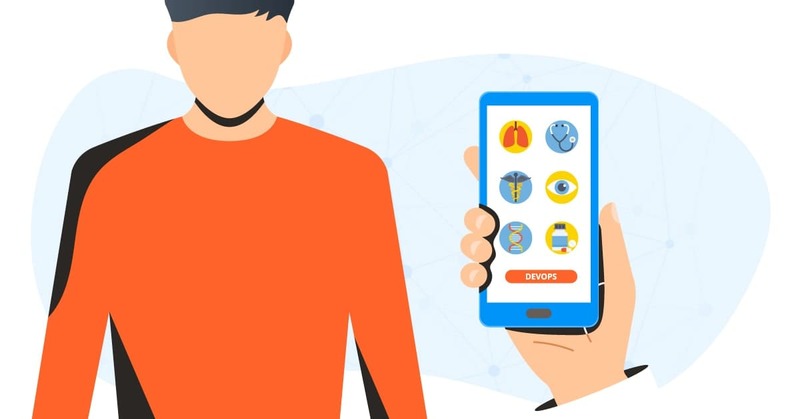 While the benefits listed above are quite substantial, listing the real-life business cases allows demonstrating the full impact of adopting the DevOps practices in enterprise healthcare industry. A multinational US-based conglomerate with more than 80,000 employees and $30B in annual revenue was providing 2 major SaaS applications to their customers through their own platform. They were using a legacy infrastructure with dedicated data centers for hosting their workloads. When they decided to augment their workflows by using an ML solution to deliver the data analytics, they discovered that the capabilities of the existing system architecture were not adequate. They decided to hire an external Managed Service Provider to deliver DevOps-as-a-Service. The contractor performed a thorough analysis of the infrastructure in place and gathered lots of input from the company stakeholders regarding the existing practices, the long-term project strategy, the goals and the milestones on the way to reaching said goals. The intended outcome was the ability to process the Big Data generated by the platform to improve the value delivery and further bolster the product evolution. The proposed solution was the transition to AWS, allowing to cut their OPEX by 45% while ensuring high availability of the products, full regulatory compliance of operations, the simplicity of integrating new products and features, as well as leveraging the AWS ML and Big Data analytics services and top-notch security features. After the pilot run the customer was completely satisfied with available AWS security features and additional AWS marketplace products the contractor chose to weave into the system. The parties are currently finalizing the Scope of Work and other specifications and the transition to the cloud for a major healthcare provider is about to begin. Another healthcare provider has a SaaS solution that integrates with various EHR systems used in hospitals. The integration helps optimize the hospital operations by predicting the need for resources and shortening the patient’s waiting times significantly. The project requirement was to optimize the SaaS platform operations in order to support more customers while using fewer resources. The contractor has split the solution into microservices and containerized them using Docker. This allowed achieving nearly real-time planning efficiency and unparalleled speed of application scaling up and down. Using Docker cgroup quotas for memory and CPU usage, the DevOps service provider was able to create a dynamic resource partitioning system. As the customer’s resource needs are not known upfront, having the ability to share spare resources allowed to ensure stable operations of mission-critical systems. The contractor has also deployed the smart monitoring and alerting system using Zabbix and Prometheus + Grafana for monitoring and ELK stack (ElasticSearch, Logstash, Kibana) for logging. The customer doubled their user pool as a result of this project, without spending significantly more on their infrastructure. An enterprise healthcare provide had a framework for delivering the healthcare services through a web portal and a mobile app. They were aiming for better infrastructure efficiency and decided to move to Microsoft Azure to ensure data flexibility and availability, thus contributing to the 24/7 availability of records and enabling 360-degrees patient view. Utilizing Azure modular resources allows configuring the front-end adjustments in minutes, without altering the back-end infrastructure and disrupting the normal app operations. The company has benefited much from this mobile-first approach to healthcare software delivery. The CI/CD pipelines introduced by the contractor allowed to shorten and simplify the software development process, greatly reducing the time to market for new releases of the products. As you can see, leveraging DevOps in the healthcare industry is the inevitable and highly sensible way of evolvement. According to Forrester, 2018 is the year of DevOps in healthcare, as more than 50% of enterprise healthcare organizations will be implementing their DevOps initiatives. The question is — is your company amongst them? If you want to keep up the pace and remain competitive — it should be! The only thing you need to implement the DevOps strategy in your healthcare business is contacting one of the reputable Managed Service Providers and benefit from employing their DevOps services!